It's a sue-or-be-sued world, so why hold back? 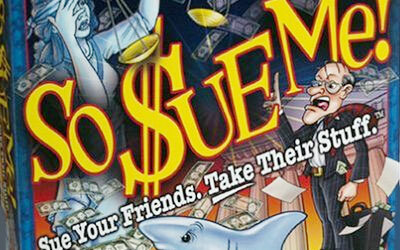 So Sue Me is the game where you sue your friends, take their stuff and enjoy the wackiness of today's lawsuits. A spin of the wheel or roll of the dice and some clever negotiating help you acquire businesses, file outrageous lawsuits, and bluff your way to big bucks. Settle or go to trial in a multi-million dollar case. You could make a fortune or go broke. Hire your friends as lawyers and seize assets. Drive others into bankruptcy and win the game. Legal knowledge not required or even desirable. Includes game board with spinner, 10-sided die, lawsuit cards, fortune cards, unfair advantage cards, colored tokens, and play money, including a one million dollar bill.